Background: Beedi rollers are exposed to unburnt tobacco dust through cutaneous and pharyngeal route. They are not aware of their rights. Studies have been conducted on beedi workers but not many studies are carried out in urban areas. Thus, study was carried out to understand working condition and health hazards in beedi workers residing in the urban slums of Mumbai and to know whether beedi roller are in better condition in urban areas. Aim: To study working condition and health hazard in beedi rollers in the urban slums. Materials and Methods: Descriptive, cross-sectional, community based study was carried in the urban slums of Mumbai with population of 8985 from April 2011 to June 2011. With snow balling sampling technique, 52 beedi workers were interviewed regarding their socio-economic status, working conditions and health problems after informed consent. Data entry and statistical analysis were performed using the SPSS windows version 14.0 software. Results: The mean age was 45 years with SD of 12 years. All were Hindu females. Around 42.31% were illiterate. Mean years of service were 30 years and they work on an average for eight hours. Children were not involved in beedi rolling. 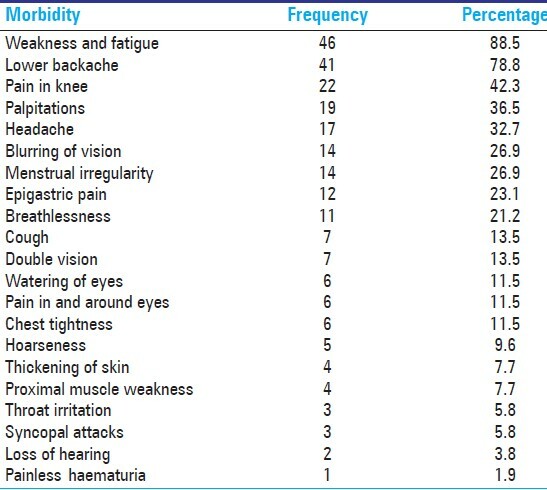 Most common morbidity was fatigue. None were aware of the benefits provided for them. Awareness regarding health hazard and safety measures was poor. Conclusions: The working condition of beedi rollers in the urban areas is not favourable. Women constitute a very high percentage of labour force in the beedi industry. Beedi rollers are exposed to unburnt tobacco dust through cutaneous and pharyngeal route. Studies have been conducted on beedi workers but not many studies are carried out in urban areas. Hence the study was carried out to understand working condition and health hazards in beedi workers residing in the urban slums of Mumbai and to know whether beedi rollers are in better working condition in urban areas. Descriptive, cross-sectional, community based study was carried in the urban slums of Mumbai. Considering the feasibility factors, the study was purposively carried out in the field practice area of the Urban Health Training Centre from April 2011 to June 2011. Snow balling sampling technique was used to identify beedi roller. Here, after interviewing with semi-structured questionnaire and examining the initial subject, the subject was asked to nominate another beedi roller currently involved in this occupation. The subjects were selected till the entire slum population of 8985 was covered. All the beedi workers who were currently involved in the beedi rolling were included in the study. Those who had left this work were not included in the study. Beedi rollers that were contacted were 61. Informed consent was taken to participate in the study. Nine beedi workers refused to participate in the study. Thus the sample size was 52. The beedi rollers were interviewed regarding their socio-economic status, working conditions and health problems. Observations were made during the interview regarding proper lighting, ventilation and overcrowding. After each interview, medical examination of each study subject was carried out. Data entry and statistical analysis were performed using the SPSS windows version 14.0 software. The age distribution of the study subjects is shown in the [Table 1]. The mean age was 45 years with SD of 12 years. All were Hindus. Only females were involved in this occupation. Around 42.31% were illiterate. Among literates, 48.08 and 9.62% had studied till secondary and primary schooling respectively. According to Modified BG Prasad classification, 42.31 and 25% belonged to class IV and class III respectively. Around 48.08% had started beedi rolling at the age of 11 to 15 years. Two of them had started at the tender age of 5 years. Maximum age at which females start beeding rolling was 30 years. Fifty women had started beedi making because their family is involved in this work. Only one woman hailed from Solapur, other women were from Andhra Pradesh. Two women had chosen this occupation after neighbours' advice. Around 26.92% of the study subjects were in this occupation for last 21 to 30 years. Mean years of service was 30 years and mode was 25 years. Women work on an average for eight hours. The work is done at home and there is no separate area for work. Five women (9.62%) work for 10 to 12 hours a day. Beedi rollers are not given paid leave. Number of beedis made are 500 to 1000 per day. Around 75% of the women make 1000 beedis per day. These women work on the daily wages. The average daily wage is Rs. 40. The women sit in the awkward working postures for many hours for rolling beedis. Out of 52 beedi rollers, 29 had children less than 14 years, but none of them had involved their children in this occupation. Most of the respondents replied that their children go to school. Regarding safety measures, only 43 women (82.7%) wash hand after beedi making. None of them wear masks or gloves. They were not aware of these safety measures. Almost none were aware benefits provided for them under various laws. Overcrowding was seen in almost all the houses. Adequate lighting and ventilation was observed in only 17.31% and 25% of the houses respectively. The morbidity in the beedi rollers are shown in [Table 2]. Most common morbidity was weakness and fatigue followed by lower backache. Out of 52 women, 10 had given birth to low birth weight baby, two of them were taking treatment for infertility and four had premature menopause. Regarding past history, three women had suffered from tuberculosis, two had asthma and one had hemiparesis. On clinical examination, 75% of them were anaemic. Three women had leukoplakia on buccal mucosa. Other findings were otitis externa and media, finger tip thickening, pharyngitis, lower respiratory tract infection, dental caries and cataract. Loss of power was seen in one woman. Only 4 women were partially aware of health hazards of beedi rolling such as it causes cancer, tuberculosis, weight loss and backache. Rest were totally ignorant about the ill effects of their occupation. Around 67.3% of the women had not taken treatment for their ailments. Nineteen women (37%) were addicted to masheri which is smokeless form of tobacco. The average wage of beedi roller in urban area is Rs. 40 per day. Thus, many beedi rollers in urban slums started alternate occupation such as tailoring, handkerchief making, mobile cover making etc., Hence, in our study we could interview only 52 women. It was observed that workers have established Trade Unions in their respective areas. But none were aware of the facilities provided for them. Beedi rollers were also not aware of the safety measures. The Union should actively raise awareness regarding the benefits available for beedi rollers and safety measures that should be practice by them. Beedi rolling causes significant health hazards. The International Labor Organization cites ailments such as exacerbation of tuberculosis, asthma, anemia, giddiness, postural and eye problems, and gynaecological difficulties among beedi workers. Our study also showed similar findings. In a study conducted by Gopal M, 65 and 9.7% of the beedi workers reported aches and cough respectively. In our study, 78.8 and 13.5% of the beedi roller had aches and cough respectively. Low birth weight was seen 19.23% of the beedi rollers. Thus in the urban area, the prevalence of morbidity in beedi rollers is high. Moreover, it was observed that in spite of there being easy availability of health care facilities, health care seeking behaviour was very poor. Many women suffered from aches for last 8 to 10 years, but still they ignored their suffering. Beedi rollers handle tobacco flakes and inhale tobacco dust and volatile components of tobacco in their work environment (often their homes) and are at risk for genotoxic hazards. None of them were aware that low birth weight could be due to tobacco. There are health care workers and anganwadi workers in the urban slums. These workers during their home visits can sensitize the pregnant women who are beedi rollers about the harmful effects of the tobacco. They can also raise awareness about safety measures such as washing hands, wearing mask and gloves, cleaning floor and storing tendu leaves in dry area. Awareness of the beedi rollers regarding adverse effects of their occupation and safety measures that has to be taken is very poor. Beedi rollers most commonly suffer from musculoskeletal pain and fatigue. The working condition of beedi rollers in the urban areas is not favourable. Authors are grateful to Mrs. Anjali Nimbhalkar (MSW), UHTC, Department of Community Medicine, K. J. Somaiya Medical College, Dr. Chinmayee Nagarsekar (Intern), and Mrs. Latika Agre (CHV) for their support in the research. 1. Kusum K. Women beedi workers: A report. New Delhi: National Commission for Women; 2005. 2. Mahimkar MB, Bhisey RA. Occupational exposure to tobacco increases chromosomal aberrations in tobacco processors. Mutat Res 1995;334:139-44. 3. Gupta PC, Asma S, editors. Bidi Smoking and Public Health, New Delhi: Ministry of Health and Family Welfare, Government of India, 2008. 4. Chavan B. Process of Female Beedi Workers: A Case Study of Maharashtra. Golden Research Thoughts. vol. 1. 2011. p. 1-4. 5. Senthilkumar N, Bharathi PS. A study on occupational health hazards among women beedi rollers in Tamilnadu, India. Int J Curr Res 2010;11:117-22. 6. Voluntary Health Association of India-India Final Research Report 2010. 7. Yasmin S, Afroz B, Hyat B, D'Souza D. Occupational health hazards in women beedi rollers in Bihar, India. Bull Environ Contam Toxicol 2010;85:87-91. 8. Available from:http://www.ilo.org/newdelhi/whatwedo/projects/WCMS_125466/lang-en/index.htm [Last accessed on 2012 June 14]. 9. Shukla P, Khanna A, Jain S. Working condition: A key factor in increasing occupational hazard among bidi rollers: A population health research with respect to DNA damage. Indian J Occup Environ Med 2011;15:139-41. 10. Bagwe AN, Bhisey RA. Mutagenicity of processed bidi tobacco: Possible relevance to bidi industry workers. Mutat Res 1991;261:93-9.